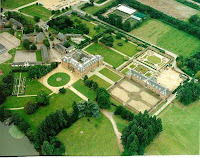 Tredegar House: Family Members Worked for Lord Tredegar? Family Members Worked for Lord Tredegar? Over the years I have met so many people who have approached me after a talk or a tour to say: "My grandfather worked as a gardener at Tredegar House before the war" or "My great-aunt was 3rd Housemaid to Lord Tredegar in the 1930s." It is wonderful whenever this happens. I am always trying to add one more fact, or one more story, to help flesh out the history of this remarkable building and the family and staff who lived and worked there for centuries. Quite often though, the grandson of the said gardener, and the great-niece of the 3rd Housemaid, although obviously having heard of Tredegar House, sometimes have never actually been there themselves. This got me thinking (usually a dangerous thing!). What if we had an evening event at Tredegar House for precisely those people? Would there be a demand for it? Perhaps a quick tour so they could walk in the footsteps of their relatives, a glass of wine, and then a sit down in the New Hall, and a question-and-answer session, where we could hear THEIR side of the Tredegar story. It would be a sort of Tredegar servants family reunion. So, did any of your relatives work at Tredegar House when the Morgans themselves were in residence? Do you have any tales of the place that you would be keen to share? Is there a list of all the Tredegar House servants dating back to the 1870s? We believe that our great grandparents worked there at this time, but have no evidence. My mother remembers going up to Tredegar house on her father's motorbike aged 5 in 1936 to viisit her grandfather Robert Rickard head gardener? One of his sons was on the gardening staff as well. Hello Looking for information on Benjamin Jenkins It says he was born at Tredegar House Monmouth South Wales on his tombstone.